Chris Hines MBE Hon.D.Sc – Founding Member of Surfers Against Sewage and Former Sustainability Director of the Eden Project. Environmental Keynote Speaker. From 1990 until 2000 Chris Hines was a founding member and Director of Surfers Against Sewage (SAS). “Some of the governments most sophisticated environmental critics.” BBC News and Current Affairs. “Britain’s coolest pressure group” The Independent. Runner up in the 1999 Green Politics Award. Solution based, Chris Hines helped deliver £5 billion spend on UK coastline. Chris has given evidence to Commons and Lords Select Committees, Monopolies and Mergers Commission and the European Parliament and Commission and was called as a special advisor to the Rt. Hon Michael Meacher MP – Minister for the Environment. Chris Hines’ media credits include everything from Panorama to BBC Newsnight live, BBC Children’s TV, the BBC World Service and CNN Skewed View. He also co-wrote and co-presented three programmes called ‘What On Earth’ with Melinda Messenger. 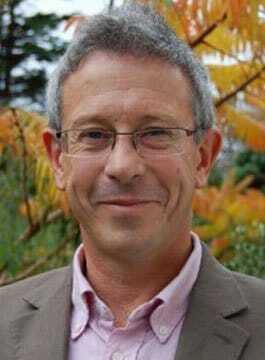 From December 2001 until September 2007 Chris Hines was the Sustainability Director at the Eden Project. He conceived and implemented the Waste Neutral concept which is an innovative look at the whole issue of waste. As well as Waste Neutral Chris was responsible for Eden’s sustainability programme, including the implementation of the PANTS process – Eden’s version of triple bottom line accounting. This aimed to ensure that Eden ‘walked the talk’ and was a leader not only rhetoric, but also in the operation of it’s own site. The worst bit of his job was sitting at his desk – he likes to be out there with the action, knee-deep in rubbish, or bashing out plans to make Eden Waste Neutral and as sustainable as possible. In October 2003, Chris Hines was selected for and attended the 9th Commonwealth Study Conference in Australia, 208 delegates from 40 countries, aimed at future leaders in society. The theme of the 2003 Tour was “People First in a Global Community” and included access to all sectors, from the homeless in Canberra to the Chief of Military Staff for Australia. He is a member of Sustainability South West, a member of the Environment Agency Regional Environmental Protection Advisory Committee, and sits on the Strategic Panel of Cornwall Sustainable Energy Partnership. Through his work at SAS and at the Eden Project, Chris has developed a deep understanding of the issues relating to the three main pillars of sustainability, namely the balance between social, environmental and financial aspects. He is a strong advocate of the business case for sustainability and was recently featured as one of the Daily Telegraph’s ‘Eco Heroes’. In September 2011 Chris Hines was awarded an Honorary Doctorate of Science from the University of Plymouth, UK. This follows the award of an MBE for “services to the environment” in the 2008 Queen’s Birthday Honours.